Lots of perishables exposed to elements and risk of mice, etc. Nuvo Garage designed and created a functional and clean space to meet all of my needs. The result exceeded my expectations and is simply beautiful! Where before it was an adventure to find what I needed, I now get to anything I need quickly as everything has a place. I literally have a second kitchen! And I can park my car in the garage in the winter and not have to brave the cold mornings in the winter. When you are an avid chef lacking space in your kitchen, expanding your pantry to the attached garage might be a natural solution. That was exactly what was happening in a chef’s garage where I completed a garage design & renovation in Brampton. This creative chef was storing both cookware and ingredients in her garage when she called me in. 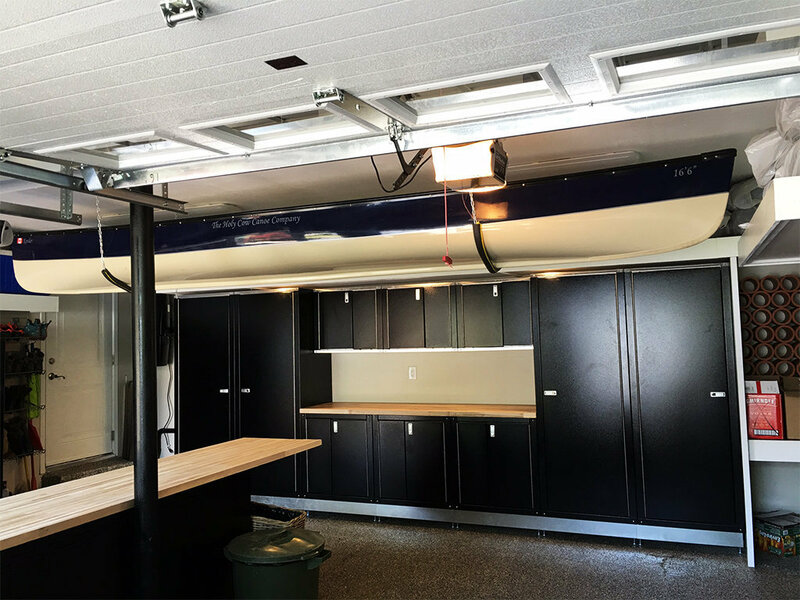 Using your garage for this purpose works well when you have the proper storage solution to protect this valuable merchandise. However, her storage was open, which was a major concern because that meant that perishable items were exposed to the elements. Her set up was also a potential field day for mice. Our chef, of course, also used the garage space for more traditional garage needs, including lawn equipment, recycling and maintenance supplies. Unfortunately, all of these things created lots of clutter, which made using the garage for a car impossible. These items were all intermixed together too, making finding things difficult. 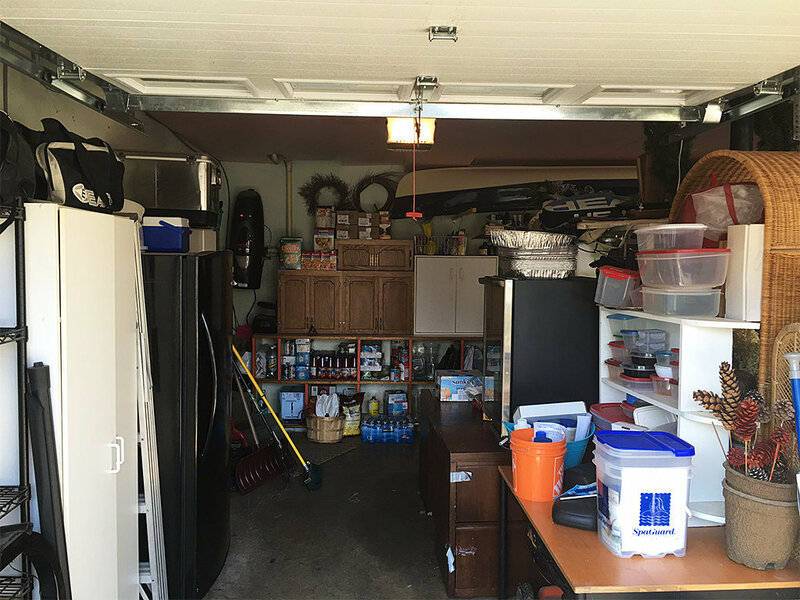 There was enough space for the majority of the items in the garage, but the space just wasn’t being utilized effectively. She tried to use various storage solutions, like cabinets and make-shift shelving, but they weren’t working well for the space. 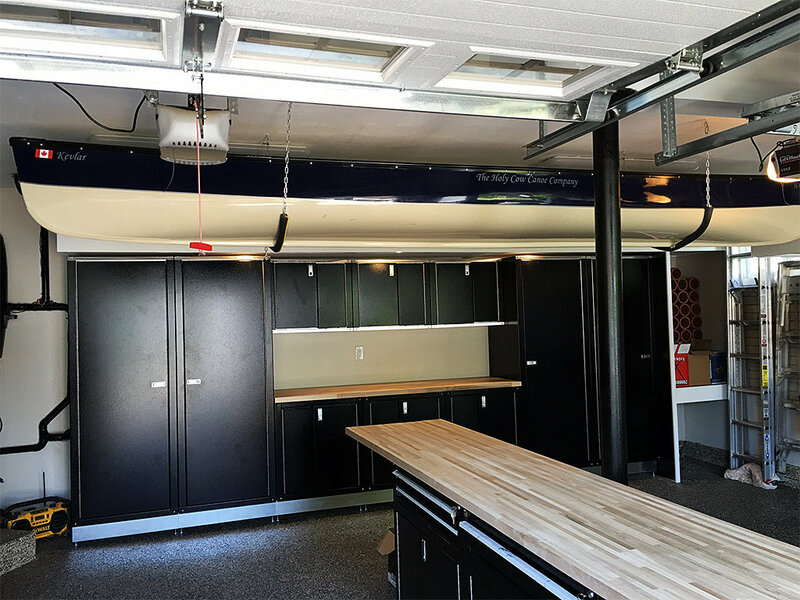 Instead, she needed a custom storage solution to use every inch of space available—including overhead space. A customized overhead storage for larger, rarely used items, including a custom-made sling for a large canoe, worked well in the space. The back wall near the door transformed into a food storage and prep space for this chef. The Iconic steel cabinet system protects and encloses food and cookware, allowed for a built-in workstation as well. The existing refrigerator and freezer were incorporated into the design to give the whole concept a sleek, put-together look. Existing tile was used to create a vertical storage solution for wine and firewood that is both functional and attractive. Perhaps the most important change was that all of the various supplies were separated by their use. One section of the garage housed food and kitchen supplies while the opposite wall turned into a Slatwall storage solution for lawn equipment and supplies. Shelving, baskets and hooks made the space efficient and practical. The design also included an island of sorts that set perfectly between the two garage doors. The island added extra storage for smaller items and another working space. It offered another way to keep the food prep space separate from the outdoor work or other maintenance work that might go on in the garage. Lighting with modern LED fixtures gave the space an updated look, and provided much better lighting to use the work areas as well. Replacing the foam ceiling with a stuccoed ceiling modernized the garage. A coat of paint on the non-Slatwall areas went a long way to make the space look brighter and functional. Finally, polyaspartic floor coating was used for a clean finish. Now, this chef can not only use her garage for maintenance supplies, garden tools and kitchen overflow, but she can also use her garage for her car in the winter.